I caught the tail end of a show on Weekend America (npr) about Deadmalls. I then went online to follow the rest of the show and it turned out that it was not about deadmalls in particular, but in a very specific deadmall, Randall Park Mall. This Mall is near where I grew up, and I logged many hours there, wandering between the Hobby Shop, Record Store, and movie Theater. I find its collapse to be oddly satisfying, perhaps because it is the ruins of capitalism or perhaps because it is the physical embodiment of my fading memory. 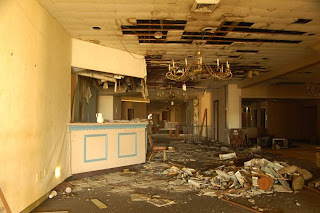 The story also has links to photos of an abandoned Holiday Inn next door. I went to my first comic book convention there, and it seemed to be a kind of magical place. I think it is because I had never stayed in a hotel, only motels.